Goldfish crackers have become a childhood staple. A bright and happy orange, their fish shape is as cute as can be. Like most toddler favorites, they’re bite-sized and can be carried around in your hands, passed out during snack time in a paper cup, or (just ask the person who does the laundry) toted around in the pockets of your overalls. As far as snack food goes, they’re certainly not the worst nutritionally. But for such small crackers, they do contain a fairly long list of ingredients…and the rainbow colored crackers contain some unpleasant food dyes that I’d rather avoid. If your child can’t have wheat or gluten, they’ll have to pass on the goldfish crackers altogether…unless you make some all natural gluten free goldfish crackers of your own! What I love about these crackers (which I found at the Gracious Pantry website) is how simple they are. They’re mostly organic cheddar cheese, which gives them a wonderful boost of protein and calcium. Less than a cup of your favorite gluten-free flour mix, a few tablespoons of organic butter and a dash of onion powder and salt are all you need! Your little one can easily help out in the kitchen as you make these. 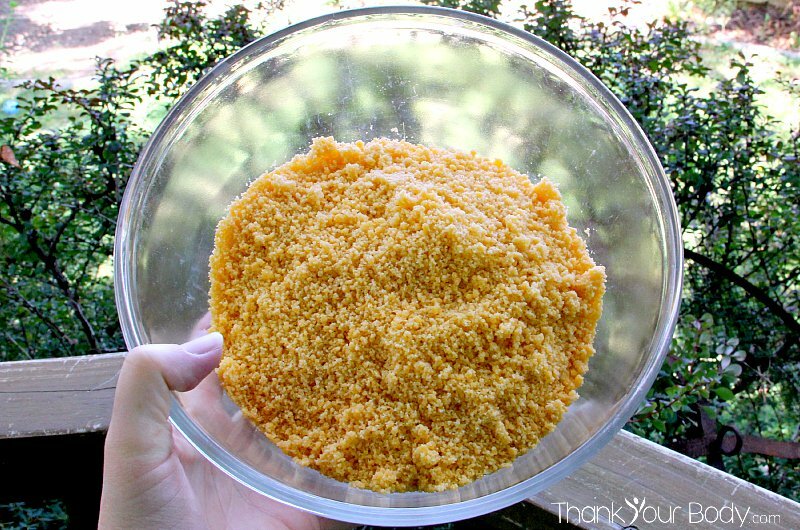 Just toss all the ingredients in a food processor, and pulse until it forms crumbs. When you see the dough, you’ll think that you’ve done something wrong…it’s very dry and looks like it needs more liquid. However, when you start to knead it the heat from your hands will help mold it into a more pliable dough. Now comes the fun part. Roll the dough out on a piece of parchment paper, and cut the crackers out with a cookie cutter. Or, use an ice cube mold like this to form the fish and then pop them out (I used this method, and cut each fish horizontally to make two crackers in the right thickness). Arrange your nutritious and cheesy sea life on a parchment lined baking sheet and pop them in the oven for about 15 minutes. At first, I was disappointed that the fish shapes spread a little so that my end result looked a bit more like puffer fish than goldfish. Then I tasted one. Yummy! These crackers are so delicious, you’ll want to eat the whole batch. So cheesy, and so full of flavor! These will easily become a favorite with your kids, and you could have a lot of fun playing with different shapes and sizes. Pop them in a lunchbox, or send a bag to nursery school with your gluten free little one…next time Dixie cups full of little orange fish are passed out before story time, your child won’t be left out. And maybe, if you’re very lucky, she’ll share a few with you! Stop worrying about what's in your kids snacks when you make these all natural gluten free goldfish crackers! Adapted from this recipe. In a food processor, pulse all ingredients until crumbs are formed. The mixture will not look like dough, but that's ok. The heat from your hands will help the dough form into a more pliable consistency. Knead the dough with your hands until it forms a pliable ball. Roll the dough out to ¼ inch thickness and cut the crackers with a cookie cutter, or pack into a mold and pop out. Arrange the fish shapes onto a parchment paper lined baking sheet, and bake for 15-17 minutes.